Rail campaigners are fighting against “crawler trains” and possible refurbished trains being introduced along the Calder Valley line. Halifax and District Rail Action Group has spoken out on the recent Commons transport select committee report which criticised refusal by government to give a date when Pacer trains will be withdrawn and the policy of ordering brand new trains for passengers in London and the South East, while expecting passengers in the rest of the country to be content with reconditioned older trains - cast-offs from more prosperous areas. The group was also critical of the proposal by Vivarail Ltd to convert a fleet of 35-year old London Underground trains known as D78 stock to diesel-electric operation as a cheap replacement for the Pacer trains. The “D-trains” would be rebuilt as modern trains, but in HADRAG’s paper they list a series of concerns about them. 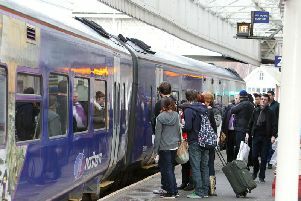 HADRAG Chairman Stephen Waring said: “One issue is that the D-trains, as well as being older than the Pacers they are expected to replace, would have a lower maximum speed of 60mph, compared with 75 for a Pacer or Sprinter train and 90 for the ‘express’ type units currently used on our line. For this reason some of us have already dubbed them ‘Crawlers’. “On the Calder Valley Line we are expecting line speed improvements within the next few years and more faster, regional express type services linking our area with Manchester Airport and other key destinations as well as cutting journey times between Halifax and Manchester. “The last thing we need is trains that cannot take advantage of higher line speeds. “We have said that, whilst we wait for possible electrification of our line, for which HADRAG continues to campaign, modern diesel trains must be provided. “After a year’s campaigning we are expecting this to specify a transformation of services across the North, keeping the promises made by government in last December’s Autumn Statement about increasing capacity and modernising rolling stock.